While there’s never a bad time to drink bubbles, nothing adds to a Valentine’s Day celebration like a bottle of sparkling wine. Thanks to a confluence of price and styles, sparkling wine sales are booming – with one bottle in every 10 sold worldwide now having bubbles. Sparkling wine – champagne, prosecco, cava – is the fastest growing segment in the wine industry and is expected to continue to be the front runner with a 24 percent increase this year. A wider range of price points has enticed value-driven consumers to purchase sparkling wines on a regular basis; and more approachable style wines, such as prosecco, have turned even novice drinkers into loyal followers. Another big boost for bubbles has been Millennials. According to The Wine Market Council, 20 and 30 year olds drink sparkling wine more regularly throughout the year than older age groups. Millennials are also the driving force behind the current popularity of sweeter-style sparkling. Dry means the exact opposite when it comes to sparkling vs. still wines, so double check the label to make sure you are getting the sweetness level you want. For instance, dry prosecco is actually the sweetest level prosecco made. Here are terms to remember from least to most sweet: Brut Natural or Brut Zero, Extra Dry, Brut, Dry/Sec/Seco, Demi-Sec and Doux/Dolce. To put it simply, if you want a dry sparkler stay with one that says Brut. If you’ve thought ahead and placed that sparkling wine in the fridge you’re all set. However, if you’re in a hurry, the quickest way to chill it down is to immerse the bottle in a bucket of ice and water, as water becomes the temperature of the ice. Plan on 20 to 30 minutes to cool it to the optimum 40-45 degree temperature. Once the bottle is open, place it back in the ice bucket. Keeping it cold helps to hold its effervescence. Sipping bubbles on their own is great but pairing them with food can be even better. As a general guide brut sparkling wines pair well with dishes such as eggs Benedict, smoked salmon, sushi, mushroom risotto and poultry. It’s no surprise that semi-dry and sweet sparkling works well with chocolate and fruit desserts but it’s also good with spicy foods such as tandoori or Thai curry dishes. Don’t be afraid to experiment because sometimes there’s nothing better than a glass of cava and a plate of fried chicken. 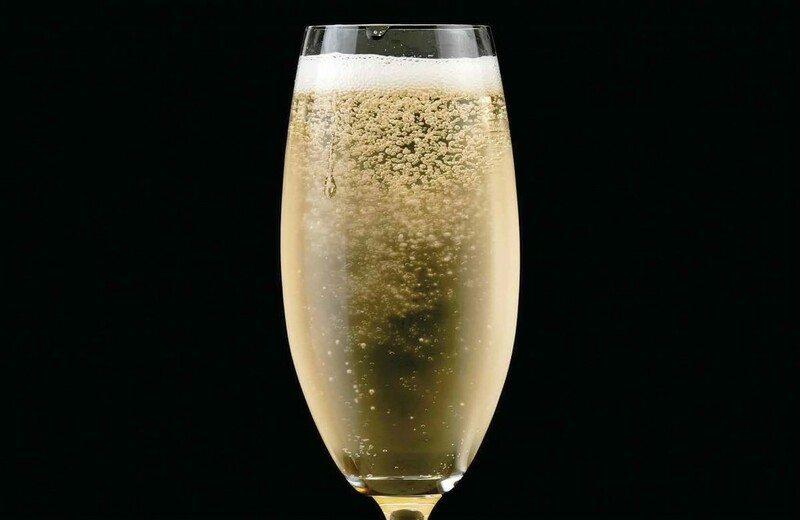 There are approximately 55 million bubbles in a bottle of champagne. A popped cork can travel up to 40 mph. Over 30 percent of today’s prosecco drinkers purchased it for the first time in 2016. 1-3 glasses of champagne a week can help prevent the onset of dementia and Alzheimer’s, according to research done at the University of Reading. The longest flying sparkling wine cork on record went 177 feet, which is more than half a football field. Peg San Felippo is a certified sommelier and has served as a judge on the American Fine Wine Competition, South Florida’s home-grown wine event.